Martin Samuel was named the Sports Journalists’ Association Sports Writer of the Year for the fifth time at the SJA’s annual gala dinner in London on March 24, 2014, sponsored for the first time by BT Sport. The sponsorship was announced on the night as the start of a three-year agreement between the broadcaster and the world’s largest national sports media members’ organisation. Samuel received his trophy from the SJA chairman, David Walker, in the the night’s penultimate announcement. It capped off an outstanding evening for his employers, the Daily Mail, who also took the Sports Newspaper of the Year title, had Mail Online’s sports site named the Sports Website of the Year, and whose veteran reporter Jeff Powell received a standing ovation at the end of the evening when he was honoured with a special presentation for the SJA’s Doug Gardner Award for services to sports journalism. Nearly 350 guests attended the gala awards dinner, staged at the Grand Connaught Rooms in London’s Covent Garden, where the work of Getty Images’ lensman Bryn Lennon was acclaimed as he took the Ed Lacy Trophy as the 2013 Sports Photographer of the Year. 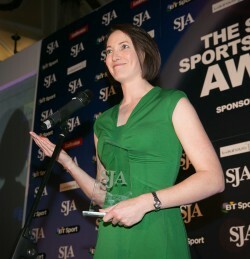 BBC Radio’s cricket commentator Alison Mitchell was named Sports Broadcaster of the Year, as voted for by the SJA’s near-800-strong membership. 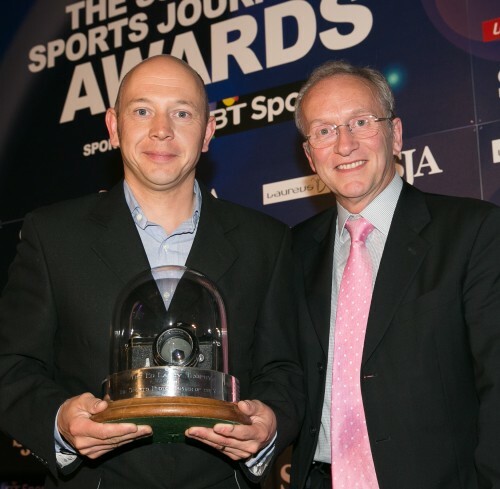 The other big winners of the night were the Telegraph’s football correspondent, Henry Winter and Jon Colman from Cumbrian Newspapers, who won their categories – Specialist Correspondent and Regional Sports Writer of the Year respectively – for a fourth time, and Matthew Syed, of The Times, who was named both Sports Feature Writer and Columnist of the Year. Lennon took the Sports Photographer title for the first time for his winning work in the Specialist Sports Portfolio, which the judges said showed “that the photographer had a total view of the sport, with strong images, presenting a great set of 10 with a surprise on every shot”. 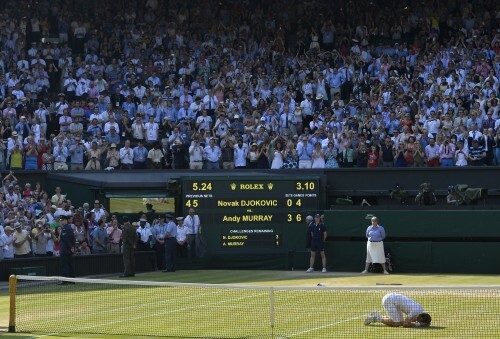 Two former Sports Photographers of the Year, Laurence Griffiths and Toby Melville, took the top sports pictures of the year, Melville, of Reuters, being awarded the Sports News Picture of the Year for his image of what was probably the moment of British sport in 2013, when Andy Murray ended the long, long wait for a British men’s winner at Wimbledon. Murray won the SJA’s Sportsman of the Year for 2013 in December. 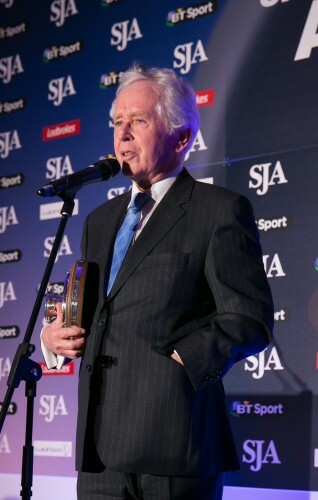 Jeff Powell’s career as one of the country’s leading sports writers for almost 50 years was recognised with the SJA’s highest honour, the Doug Gardner Award, presented to him by two former England coaches, football’s Terry Venables and rugby’s Sir Clive Woodward, together with Arsenal Double-winning captain Frank McLintock. In announcing the award, David Walker, the SJA chairman, said that Powell had “displayed the ability to reinvent himself by dealing with the challenges of modern, multi-platform journalism. “He has not stood still … He’s embraced different sports plus website journalism and gone for it,” Walker said. Walker highlighted how Powell had gone from being a leading football writer to taking on responsibility for covering boxing, working his contacts effectively to such an extent that the Mail writer was the only journalist invited to the 70th birthday party of Muhammad Ali. Other high points of the night, which was presented by John Inverdale and Sybil Ruscoe, included ITV winning the Television Sports Programme of the Year prize for the first time for their moving series of documentaries, Sports Life Stories, while TalkSport made a breakthrough in the Radio Sports Programme category with their My Sporting Life. The Sports Journalists’ Association was founded in 1948 and is the world’s largest national membership organisation of sports media. Its sponsors include BT Sport, The National Lottery, Laureus and Ladbrokes. Since 1949, it has staged the country’s longest running annual Sports Awards; this year’s event will be staged in December. The Sports Writer of the Year award has been presented since 1976. The Sports Photographer of the Year award has been presented each year since 1977.